Are you a new pet owner or that pet lover who has been having a challenge when it comes to feeding them? Here are five benefits associated with the new and most appealing pet feeding technology, also referred to as automatic pet feeders. It is most imperative that the pets consume regular amounts of food consistently so that they can enjoy steady growth and development. For this reason, vets recommend that as the animal grows, they should have their food increased in a certain manner. With an automatic feeder, you get to preset the amount of feed the devices dish out to your pet. In return, the pet can develop in the right manner and have a great physical health, not to forget the tenacity to fight off ailments. For information and variety checks, visit The Unusual Pet Vets. Here, you will have all your queries answered in the finest manner. If you happen to have a busy schedule or attachments that keep you away from the house for long periods, this is the perfect solution for you. All you have to do is stock the food into the feeder and set the time gaps that the machine dispenses the meals. You can then run your errands relaxed, as you are certain that the darling puppy or cat is well taken care of at home. It is appalling to have pet food scattered all over the place, especially if you carry your pet to public places, for instance, your place of work. Automatic feeders are designed to dispense off just the required amounts of food, that which the pet can finish without much of a problem. Instead of the pet having huge amounts of food at long intervals, they can get many small amounts. The result of this is that you avoid having a scenario whereby the pet starts to play with the food. 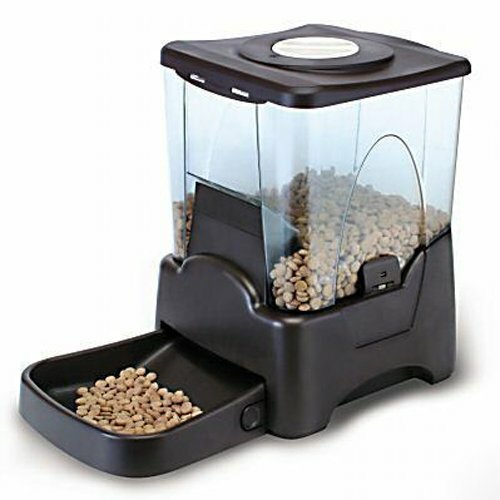 If you are looking to maintain a good relationship with your pet without wrecking your environs, automatic feeders ought to be in your forethought. There are instances whereby one stocks a huge amount of feed for their beloved animal friends to consume for long periods. By the time the animal eats the last piece of the meal, it is usually stale and no longer enjoyable. In most cases, the animals completely refuse to eat the last bits of such meals. With the new apparatus, however, the pet always gets a fresh meal when feeding time comes, much to their delight and satisfaction. If you have a busy schedule or are engaged in demanding undertakings, you should really consider having such a device for your loving animal companion. The reason behind this suggestion is the time you get to save with these feeders. All you have to do is set the time gaps and fill the apparatus with the food. Thereafter, you can go on with your engagements with little worry about the welfare of the pet. There you have it, the latest and most reliable technology concerning pet feeding.